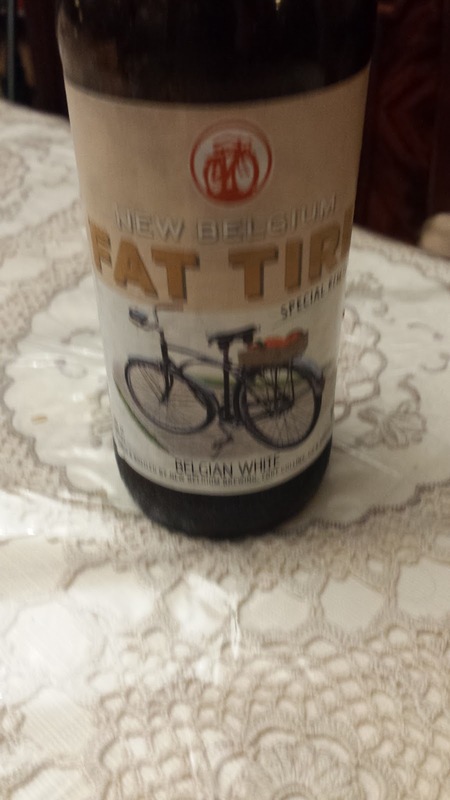 This week's Belated Sunday Night Suds looks at New Belgium's Fat Tire Special Edition Belgian White. [Post is belated due to family road trip before school]. I found this beer in Oliver's in Albany, a beer store which I have come to believe may be the greatest beer store on the East Coast. I had never seen nor heard of Fat Tire experimenting with a witbier, so I picked up a six pack and split it with a friend. The beer itself was unlike any Fat Tire I had ever tried, including last year's Fat Tire and friends series. After trying two of these, I still can't really tell what makes this a Fat Tire Belgian White, as opposed to a witbier produced by New Belgium Brewery. This is not to say that the beer itself was unremarkable or weak. The beer poured a golden amber with good carbonation and lacing. There were phenols present, but they were a little more subtle then your average witbier and the citrus was a little more forward than I would have expected as well. The combined flavor and the low end alcohol content (5.2% abv) make this a beer which you can actually have more than one of at a meal. The New Belgium Fat Tire Special Edition Belgian White is under kosher supervision by the Scroll-K/Va'ad of Denver, but not every brew produced by New Belgium is under kosher supervision. For a list of the New Belgium brews currently under supervision, please click on the link on the left side of my home page for my latest Kosher Beer List. To see what the experts on Beer Advocate think about The New Belgium Fat Tire Special Edition Belgian White, click here beeradvocate.com/beer/profile/192/275731. Please Note - if you are reading this post more than six months after it was written, please note that it is possible that the product is no longer still certified kosher. To verify that the product is still certified kosher, please click on the kosher beers list link on the top left corner of the blog.